While Azure Logic Apps, Microsoft Flow, and PowerApps offer over 180+ connectors to connect to Microsoft and non-Microsoft services, you may want to communicate with services that are not available as prebuilt connectors. Custom connectors address this scenario by allowing you to to create (and even share) a connector with its own triggers and actions. For private APIs, Microsoft offers on-premises data connectivity through an on-premises data gateway. These gateways are supported by Logic Apps, Microsoft Flow, and PowerApps. You can set up Azure AD authentication for your API in the Azure portal so you do not have to implement authentication or you can require and enforce authentication in your API's code. For more information about Azure AD for custom connectors, see Secure your API and connector with Azure AD. Create a custom connector from scratch. OpenAPI definitions and Postman collections use different formats, but both are language-agnostic, machine-readable documents that describe your API. You can generate these documents from various tools based on the language and platform used by your API. 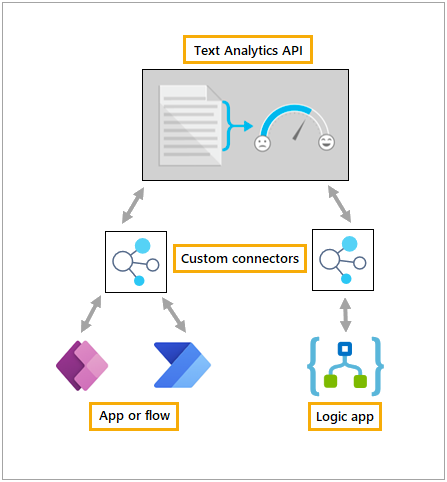 Behind the scenes, Logic Apps, Flow, and PowerApps use OpenAPI to define connectors. Custom connectors are used the same way Microsoft-managed connector are used. You will need to create a connection to your API and then you can use that connection to call any operations that you have exposed in your custom connector. You can share your connector with users in your organization in the same way that you share resources in Logic Apps, Microsoft Flow, or PowerApps. Sharing is optional, but you may have scenarios where you want to share your connectors with other users. For more information, see Share custom connectors in your organization. If you would like to share your connector with all users of Logic Apps, Microsoft Flow, and PowerApps, you can submit your connector for Microsoft certification. Microsoft will review your connector, check for technical and content compliance, and validates functionality. For more information, see Submit your connectors for Microsoft certification. The tutorial uses the Cognitive Services Text Analytics API. Microsoft already provides a connector for this API, but it is a good example for teaching the custom connector lifecycle and how custom connectors can support unique scenarios. The connector you will build exposes the Text Analytics Sentiment operation which returns the sentiment score (0.000 to 1.000) for the text input.